Did you know that there are 50 days in the Easter season? Not one, but 50! That’s even more days than there are in lent! The Easter season begins with Easter Sunday, and ends with Pentecost. 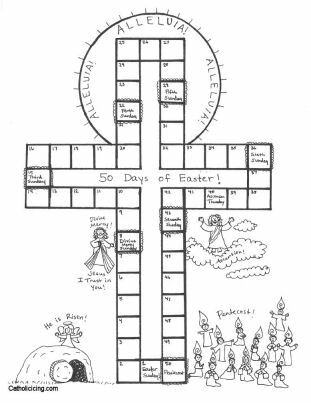 In order to help my kids and I remember that the Easter season is an ongoing thing, I made this religious Easter countdown calendar which starts on Easter Sunday, and ends on Pentecost Sunday. The best part about this Easter countdown calendar is that it’s printable, and free for all of you! Make sure you allow the image to download completely before printing, otherwise it may result in a half printing job. I’m sorry, but I cannot troubleshoot your printer problems with you- thank you for understanding. If you’re having trouble printing, try downloading them first rather than printing straight from the doc. This Easter calendar doesn’t include calendar dates, so it’s good for every year! Some days I included when drawing this calendar are Divine Mercy Sunday (which Pope John Paul II instituted as the second Sunday of Easter), all 8 Sundays of Easter, Ascension Thursday, and Pentecost. This is a great tool for teaching your kids about the liturgical year, so I hope you find a use for it! I’m going to have my kids mark off each day with a sticker. (I think I have a bunch of small Easter stickers left over from an egg dying kit around here somewhere). Other options would be coloring one square each day, or marking them off with “x’s”. You could also laminate the calendar with contact paper, or put it in a Dollar Store frame and then mark off the days with a dry erase marker. I also though about decoupaging it to a cookie sheet, and moving a magnet one square each day. It’s totally up to you. Just for fun, I’m also offering the Easter calendar in color, and it’s also free! 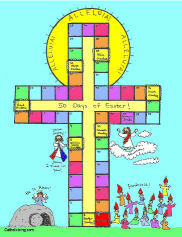 If you’d like to print the colored Easter calendar for free, but are not yet a subscriber, no problem! Subscribe here, or by entering your email address into the box below. After entering your email address, an email will be rushed to your inbox for you to verify your subscription. Please click the link in it. After that, you will receive an email after the next blog post is published with access to the Subscriber bonus page! If you’re looking for a countdown calendar that ends on Easter, you need to check out my printable Lenten calendar. If you’re looking for more ideas on how to celebrate all 50 days of Easter, check out this post. Do you prefer to just buy the colored version of the Easter calendar instead? You can purchase it right now for just $1.00. There will be an immediately download pop-up, as well as an email with a link to download that will arrive just a bit after your purchase. Gorgeous! Thank you so much for this. My daughter has loved your Lenten calendar so I know she will be thrilled. Thank you for this Lacy. The children will love it! We already use your Lenten calendar, so this will be a great addition! This is great and I love that you can use it every year. Thanks so much, I'll be linking. Lacy, this is fantastic! My kiddos are enjoying the lenten calander so much and they will be thrilled with this one as well. Thanks! Thank you for this calendar! I cut out a small white cross and put poster tack on the back so my 4 year old can move the cross each day. This is great for all of our children to follow the Easter season, too! I really enjoy your site. I am always looking forward to seeing your new ideas. I would like to thank you for sharing so much for free!